You’ve been dropping down Snowbasin’s 2,950 feet of vertical terrain—hitting the same downhill lines that Olympic athletes once graced—and hiking up Strawberry Peak to get fresh powder turns. A peanut butter & jelly sandwich just ain’t gonna cut it. 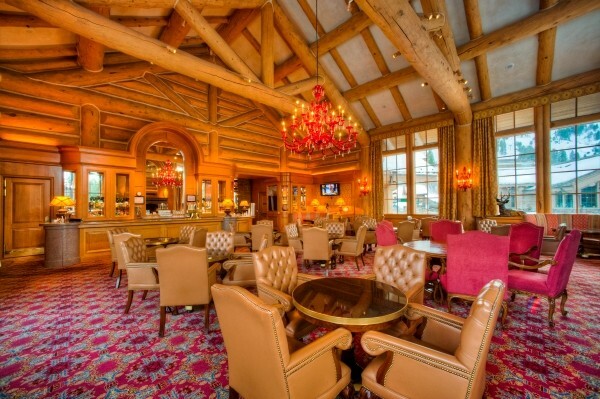 A gem of an establishment, Cinnabar Lounge is tucked in Earl’s Lodge at the resort base. It’s the perfect mix of an elegant restaurant and a cozy, wooden aprÃ¨s-ski joint. The 30-foot-plus-tall cathedral ceilings reveal massive wooden beams that stand in juxtaposition to a gorgeous red hand-blown glass chandelier from Italy in the center of the 65-person-capacity room. Steel deer sculptures flicker in the light of the large fireplace’s flames. It’s a little oasis during or after a ski day. But who cares about the tasteful environs if the food is unpalatable, right? Like the Cinnabar’s accoutrements, there’s no skimping. For lunch, I ate the smoked-duck carpaccio, served with a cherry and Port compote, arugula and warm bread ($12). The compote’s brightness and mild tartness played nicely with the fatty, savory duck. Being a powder whore on fine ski days, I usually skip lunch, opting to munch powder instead, but this was a hard-to-resist treat worth stopping for. Also, a hefty lunch is the coreshot to my athletic motivation, so this dish, as well as other selections such as the stuffed quesadilla and California grilled cheese, are perfectly sized to keep the shred alive. Plates for sharing—Italian meats or imported cheese—were stacked on an adjacent table. For a more filling aprÃ¨s-ski meal, try some of Chef Eric Byrd’s other specialties, such as pork medallions, the bison burger or fish tacos. That will surely wrap up a mouth-watering day at Snowbasin, an under-talked-about purveyor of skiing and eating in the Wasatch.